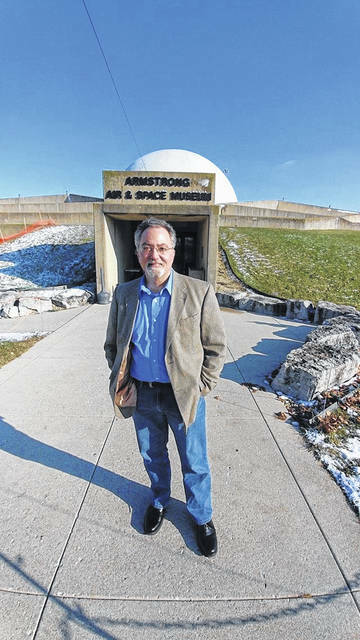 WAPAKONETA — Dante M. Centuori has been named the new executive director of the Armstrong Air & Space Museum, according to an announcement from Joe Lenhart, president of the museum’s board of directors. Centuori, who will begin in his new position on Jan. 7, earned his Bachelor of Astronomy and Physics degree from Yale University and brings more than 30 years of experience in designing, training and presenting informal science education programming to the position. His collaborative work with ideastream, Cleveland’s public broadcasting platform, earned several communication industry awards, including three regional Emmy award nominations, Lenhart stated. At the Great Lakes Science Center of Cleveland, he held positions such as Scientist in Residence, Director of Creative Productions and Director of Education and Outreach. At GLSC, Centuori played a role in developing programs and exhibits for NASA Glenn Research Center’s Visitor Center, which relocated to the Science Center in 2010. Centuori said he is looking forward to the challenge of leading the team at the Armstrong Air & Space Museum through the current construction project and the 50th anniversary celebration of the first steps on the moon in 2019. Museum association President Joe Lenhart thanked interim director Brittany Venturella for the work she performed at the museum during the search for a full-time director.